Lower denomination definitive Swiss stamps went through a new evolution, beginning in 1934. The lower denomination definitive stamps of the Tell Types had been around since the beginning of the century, and it was time to replace them. New small sized lower denomination stamps first appeared in 1934, and the new designs, with a more modernistic look and feel to them, featured Swiss landscapes. These new definitive stamps were well received and they would remain in use as the preferred definitive postage stamps of Switzerland for the next twenty years! In order to avoid typing repetitive and possibly confusing text after each group of illustrations, I have made the catalog tables on this page VERY DETAILED. The types of paper, gum, output format, and shades (where appropriate) are included in the tables. All of the Swiss stamps on this page that are indicated as having been printed in booklets were printed in special booklet-format sheets, thus they are also collectible in inter-space pairs and in tête-bêche pairs. All of the Swiss stamps on this page that are indicated as having been printed in coils have a control number printed on the back of every fifth stamp in the coil roll. Stamps with these control numbers are scarce, and in most cases, they are much higher priced than verifiable coil stamps without the control numbers. For detailed information on booklets, booklet panes, inter-space pairs, Tête-bêche pairs, and coil stamps, please refer to the Zumstein or Michel specialized catalogs. 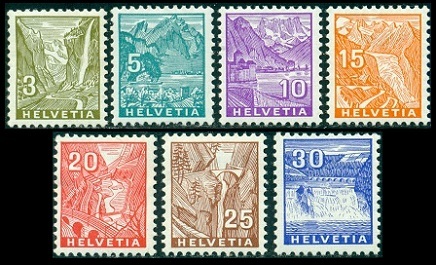 The seven Landscape Type definitive Swiss stamps shown above were issued on July 2, 1934. They were typographed on granite paper with the Swiss Cross watermark, and they were all issued with "grilled gum". 03 C. (1934 - Grilled - ZU #194, Mi. #270, Sc. #219) - Staubbach Falls - Issued in sheet-format. 05 C. (1934 - Grilled - ZU #195, Mi. #271, Sc. #220) - Mt. Pilatus - Issued in sheet-format and booklets. 10 C. (1934 - Grilled - ZU #196, Mi. #272, Sc. #221) - Chillon Castle on Lake Geneva - Issued in sheet-format and booklets. 15 C. (1934 - Grilled - ZU #197, Mi. #273, Sc. #222) - Rhone Glacier - Issued in sheet-format and booklets. 20 C. (1934 - Grilled - ZU #198, Mi. #274, Sc. #223) - St. Gotthard Railroad - Issued in sheet-format and booklets. 25 C. (1934 - Grilled - ZU #199, Mi. #275, Sc. #224) - Via Mala Gorge - Issued in sheet-format. 30 C. (1934 - Grilled - ZU #200, Mi. #276, Sc. #225) - Rhine Falls - Issued in sheet-format. During 1936, the Landscape Types of 1934 were re-drawn, and two new denominations were added. Due to engraving, instead of typography, these new Swiss stamps have much sharper images. 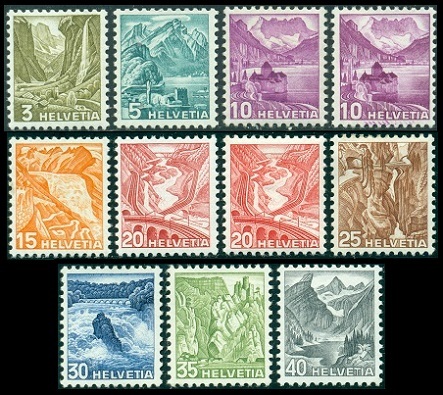 The nine new Landscape Type definitive Swiss stamps shown above were issued on November 2, 1936. They are engraved on white, unwatermarked paper, and they were issued with both "smooth gum" and "grilled gum". ﻿10 C. - Type I - The shading inside the "0" of "10" has only vertical shading lines. 10 C. - Type II - The shading inside the "0" of "10" includes two diagonal lines. 20 C. - Type I - Light shadows and shading lines. Stones in the bridge arches are small. 20 C. - Type II - Darker shadows and shading lines. Stones in the bridge arches are larger. 03 C. (1936 - Smooth - ZU #201y, Mi. #297y, Sc. #227) - Staubbach Falls - Issued in sheet-format and coils. 03 C. (1936 - Grilled - ZU #201z, Mi. #297z, Sc. #227a) - Staubbach Falls - Issued in sheet-format. 05 C. (1936 - Smooth - ZU #202y, Mi. #298y, Sc. #228) - Mt. Pilatus - Issued in sheet-format, coils, and booklets. 05 C. (1936 - Grilled - ZU #202z, Mi. #298z, Sc. #228d) - Mt. Pilatus - Issued in sheet-format and booklets. 10 C. (1936 - Type I - Smooth - ZU #203y, Mi. #299Iy, Sc. #229b) - Chillon Castle on Lake Geneva - Issued in sheet-format and booklets. 10 C. (1936 - Type I - Grilled - ZU #203z, Mi. #299Iz, Sc. 229e) - Chillon Castle on Lake Geneva - Issued in sheet-format and booklets. 10 C. (1936 - Type II - Smooth - ZU #203Ay, Mi. #299IIy, Sc. #229) - Chillon Castle on Lake Geneva - Issued in sheet-format, coils, and booklets. 10 C. (1936 - Type II - Grilled - ZU #203Az, Mi. #299IIz, Sc. #229d) - Chillon Castle on Lake Geneva - Issued in sheet-format and booklets. 15 C. (1936 - Smooth - ZU #204y, Mi. #300y, Sc. #231) - Rhone Glacier - Issued in sheet-format. 15 C. (1936 - Grilled - ZU #204z, Mi. #300z, Sc. #231a) - Rhone Glacier - Issued in sheet-format. 20 C. (1936 - Type I - Smooth - ZU #205y, Mi. #301Iy, Sc. #232) - St. Gotthard Railroad - Issued in sheet-format. 20 C. (1936 - Type I - Grilled - ZU #205z, Mi. #301Iz, Sc. #232c) - St. Gotthard Railroad - Issued in sheet-format. 20 C. (1936 - Type II - Smooth - ZU #205Ay, Mi. #301IIy, Sc. N/L) - St. Gotthard Railroad - Issued in sheet-format and booklets. 20 C. (1936 - Type II - Grilled - ZU #205Az, Mi. #301IIz, Sc. N/L) - St. Gotthard Railroad - Issued in sheet-format and booklets. 25 C. (1936 - Smooth - ZU #206y, Mi. #302y, Sc. #233) - Via Mala Gorge - Issued in sheet-format. 25 C. (1936 - Grilled - ZU #206z, Mi. #302z, Sc. #233a) - Via Mala Gorge - Issued in sheet-format. 30 C. (1936 - Smooth - ZU #207y, Mi. #303y, Sc. #234) - Rhine Falls - Issued in sheet-format and coils. 30 C. (1936 - Grilled - ZU #207z, Mi. #303z, Sc. #234a) - Rhine Falls - Issued in sheet-format. 35 C. (1936 - Smooth - ZU #208y, Mi. #304y, Sc. #235) - Balsthal Pass - Issued in sheet-format. 35 C. (1936 - Grilled - ZU #208z, Mi. #304z, Sc. #235a) - Balsthal Pass - Issued in sheet-format. 40 C. (1936 - Smooth - ZU #209y, Mi. #305y, Sc. #236) - Alpine Lake and Mt. Säntis - Issued in sheet-format. 40 C. (1936 - Grilled - ZU #209z, Mi. #305z, Sc. #236a) - Alpine Lake and Mt. Säntis - Issued in sheet-format. The 20 C. denomination Swiss stamp, shown above, at the left, was issued with a new design on September 17, 1938. The new design features the Parish Church of San Giorgio in Castagnola, with Lake Lugano and San Salvatore in the background. 20 C. (1938 - Smooth - ZU #215y, Mi. #327y, Sc. #243) - Parish Church of San Giorgio - Red - Issued in sheet-format, coils, and booklets. 20 C. (1938 - Grilled - ZU #215z, Mi. #327z, Sc. #243c) - Parish Church of San Giorgio - Red - Issued in sheet-format and booklets. The 10 C. denomination stamp of 1936, shown above, at the right, was re-issued, in new colors and in various permeations, between 1939 and 1942. 10 C. (1939 - Smooth - ZU #242y, Mi. #363ay, Sc. #230) - Chillon Castle on Lake Geneva - Brown - Issued in sheet-format, coils, and booklets. 10 C. (1940 - Grilled - ZU #242z, Mi. 363az, Sc. #230e) - Chillon Castle on Lake Geneva - Dark Brown - Issued in sheet-format and booklets. 10 C. (1942 - Smooth - ZU #257, Mi. 363b, Sc. #230B) - Chillon Castle on Lake Geneva - Reddish Brown - Issued in sheet-format, coils, and booklets. 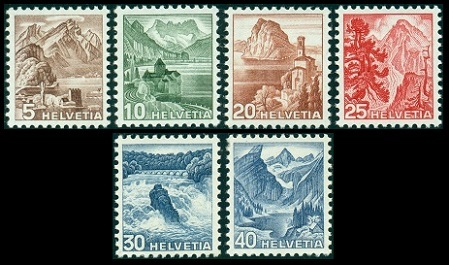 The six Landscape Type definitive Swiss stamps shown above were issued on March 15, 1948. They were all printed on white, unwatermarked paper with smooth gum. These new definitive Swiss stamps feature changed colors, and the 25 C. denomination features a brand new design. 05 C. (1948 - ZU #285, Mi. #500, Sc. #316) - Mt. Pilatus - Dark Brown - Issued in sheet-format, coils, and booklets. 10 C. (1948 - ZU #286, Mi. #501, Sc. #317) - Chillon Castle on Lake Geneva - Green - Issued in sheet-format, coils, and booklets. 20 C. (1948 - ZU #287, Mi. #502, Sc. #318) - Parish Church of San Giorgio - Orange Brown - Issued in sheet-format, coils, and booklets. 25 C. (1948 - ZU #288, Mi. #503, Sc. #319) - Grisons National Park - Red - Issued in sheet-format. 30 C. (1948 - ZU #289, Mi. #504, Sc. #320) - Rhine Falls - Greenish Blue - Issued in sheet-format and coils. 40 C. (1949 - ZU #290, Mi. #505, Sc. #321) - Alpine Lake and Mt. Säntis - Ultramarine - Issued in sheet-format.